The Open Floor crew discusses whether or not Golden State has become too reliant on Kevin Durant, especially when the rest of the Warriors are struggling. 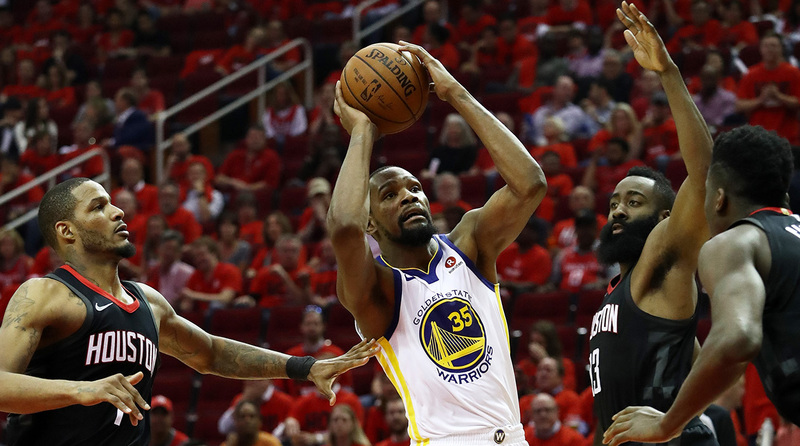 On the latest episode of Open Floor, Ben Golliver and Andrew Sharp talk about the former's column on fans appreciating Kevin Durant and whether or not Durant has changed the way Golden State plays for the worse. Andrew Sharp: I want to congratulate you because I think your column did a really nice job making the most coherent argument for the other side of the Durant conversation. I think you are still completely wrong and missing the bigger picture and you're out of touch with actually how people watch sports but you argued it really well and I was proud of you. As far as KD, the role player thing is interesting. You can say pretty conclusively that the Warriors are actually better when he is playing that role player role for them. When you are running everything through KD, it takes them away from what makes them special and what makes them particularly impossible to guard. What do you think about that? Ben Golliver: I don’t think that is the right way to frame it—because this is not about a role player. These guys have a system. Everyone is part of the conclusion. It is not like there is a pecking order of there is an alpha or whatever. It is about five guys working together and when everyone is locked in the ball is humming, they got the pace of their game, everyone is able to get wide-open shots and looks. Everyone looks better and everyone benefits from that. But in those types of games, KD is not going to have those 40-point nights. I think it is the fantasy basketball situation and not to go on a blog boy rant here, but because KD has 38 points does not mean that he had a great game or the Warriors had a great game as a team. He can have an incredible game—score 25 points and do so on 12 shots—and you would call him a role player because he only took 12 shots. It is just silly. Golliver: Yeah you do it all of the time. It is disrespectful to him and Kerr kind of made the same point the other night. He was like we have the ultimate luxury in having KD, when our offense breaks down and no one else is hitting, we can just go ahead and feed him the ball and let him take over and go create a shot for himself. It’s the ultimate luxury. This guy is the second best player on the planet. Sharp: What I am telling you, Ben, is that we saw in Game 2 what happens when he plays that superstar role for them. He became a crutch. Golliver: Nah man. Stop. Stop. Sharp: He took them out of what makes them great. Golliver: That is not true. Sharp: It is true. It is 100% percent true. I watched the game. Golliver: It’s a chicken and the egg thing. He goes to do that because no one else is stepping up. He didn’t start the game coming out shooting their first 15 shots. Steph is out there and misses his first seven three-pointers. What is KD supposed to do? Klay Thompson wasn’t playing well. It wasn’t a KD-caused phenomenon. KD was the result, not the cause of that. You can’t blame him for that. Sharp: That is fine. I am not blaming him for that whatsoever. What I am telling you is that it speaks to the dynamics in Golden State. Golliver: They are going to be better when the other four guys play better, Andrew. If KD is the only guy playing well they are not going to look as good. You can’t blame KD for that. Sharp: Bigger picture: My counter to your column on Durant would be what has really bothered me the last year and a half of discourse surrounding all of this, is that I hate the idea that real basketball fans or intelligent basketball fans should appreciate Kevin Durant regardless of what he did. I think that is perfectly reasonable to say Durant on a team with three Hall of Famers is less interesting than Durant on OKC two years ago or on any other team in the NBA where he asked to do more. If you are a real basketball fan you understand that. Personally, I appreciate KD’s talent and I think it is really a bummer the way all of this has unfolded because he is now in a situation where it is harder to appreciate how unbelievable he is. He is clearly in the middle of his prime and is at the peak of his powers, he has stripped his game of any weaknesses and I think watching him against Chris Paul in this series is pretty funny compared to where he was with Chris Paul in 2014 where I think it was Clippers-Thunder and Chris Paul was pretty successful at bothering KD. And this series, rather than just put the ball on the floor or back Chris Paul down, Durant just rises and shoots over CP3. Chris Paul has been roasted every time he's tried to guard Durant. It is great to see him in his prime and playing this well, I just wish it were happening in a situation where easier to appreciate how incredible he is.